After a rather enjoyable Bottlehead Crack build, I decided to press forward with another of Bottlehead's relatively inexpensive kits, the Bottlehead Seduction. 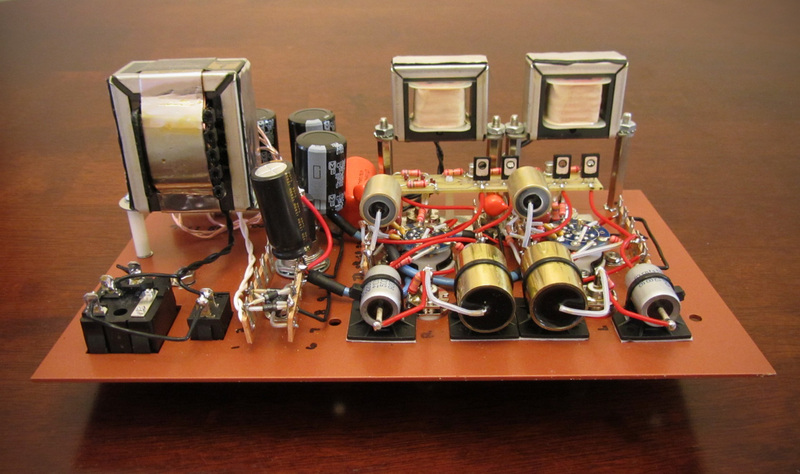 The Seduction is a phono pre amp. For those of you who aren't familiar with record players, a phono preamp is necessary to bring the output of a moving magnet or moving coil cartridge up to a standard line level input using RIAA based equalization. 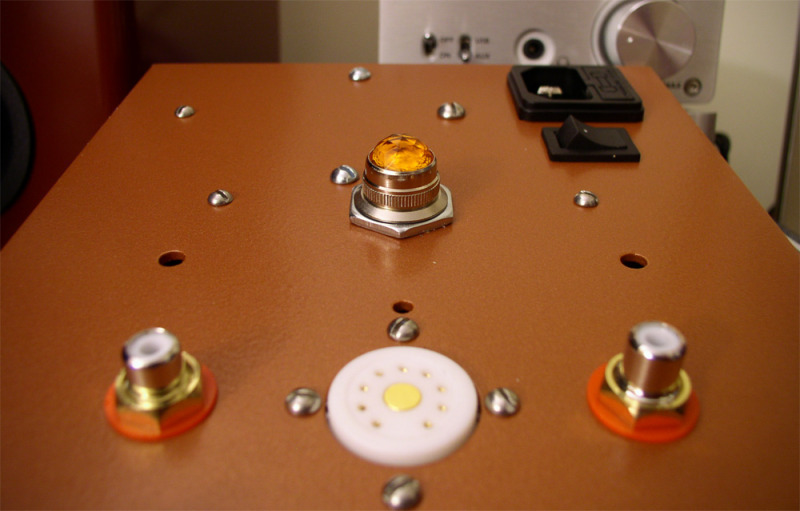 The accuracy of this equalization is important, so when building a phono pre-amp, the parts values should be as close as possible (in other words, aim for the +/- 1% resistors and capacitors when possible). 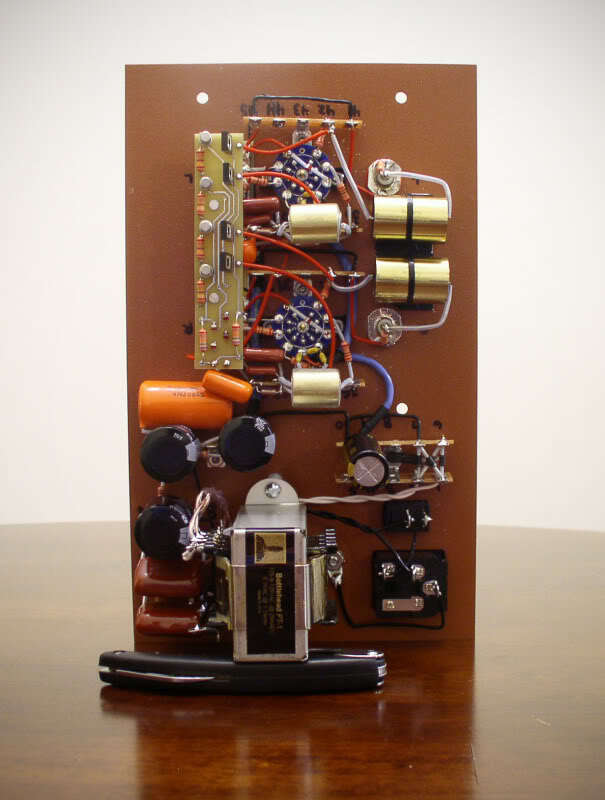 The Seduction has been offered by Bottlehead for quite some time, 10 years I believe and was designed by Paul Joppa. 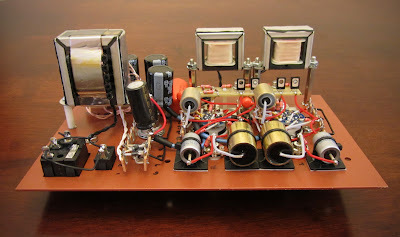 This phono pre is two stages, and makes use of a pair of 6922 / 6DJ8 tubes, which are very commonly used for audio. This makes purchasing good vintage ones a rather expensive task, but there are plenty of good quality new-production and JAN (Joint-Army-Navy) tubes available for reasonable prices. 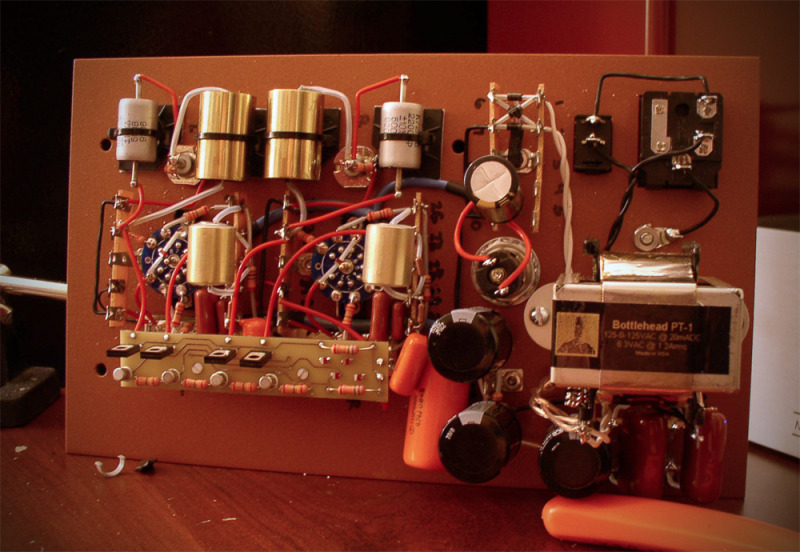 As typical with Bottlehead builds, there is a Constant Current Source Upgrade. This adds $75 to the $369 price (as of Feb 2011), but, as always, is worth the small investment. 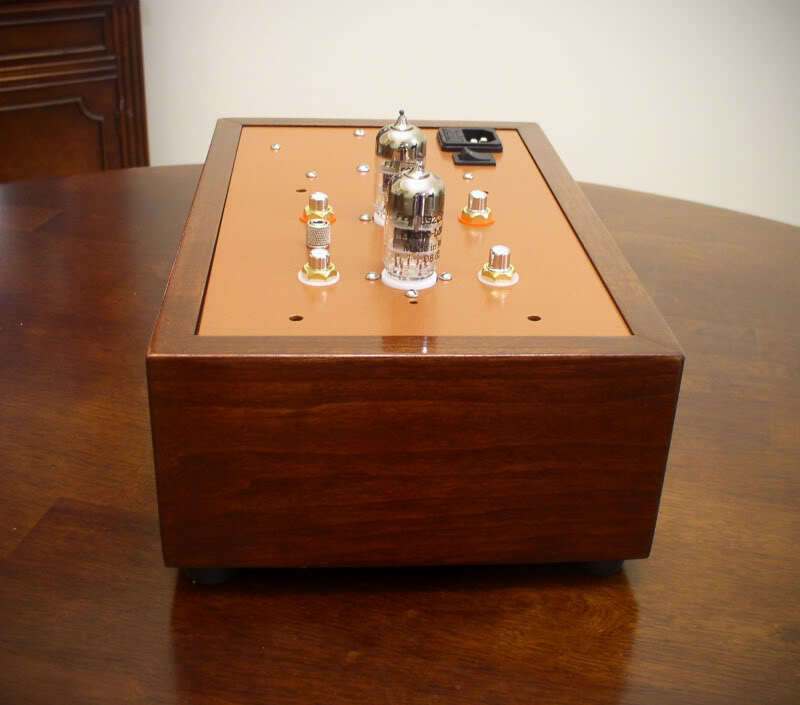 From the Bottlehead site: Now the benefits of increased dynamics, more quiet background, better bass control and added gain found can be had for the Seduction phono preamp. Four Camille Cascode Constant Current Sources replace the stock plate load resistors, dramatically increasing the load impedance for greater Power Supply Ripple Rejection (PSRR) and the extraction of the full gain available from the tubes (up from about 36dB in the stock form to about 40dB). Cardas, Kimber and Neotech Teflon wiring. I also used one of the Orange Drop caps in the kit to bypass one of the power supply caps, you can see it wedged on the left in the photo below. The top plate was given a copper colored powder coat, and the wood was treated with a variety of MinWax products to give it that nice reddish brown color. Please click to enlarge any of the photos below. The Obbligatos are very nice caps for very little money but probably aren't the last word in detail. I opted to add the teflon bypass caps try and extract a little bit more. The Russian teflon bypass caps are old war caps, you can snag them on ebay for a song, just keep an eye on shipping as it tends to cost more than the caps. You'll also find that they are quite large compared to other similarly rated caps, so keep this in mind when you try to fit them in a build. I ended up with miniature 2200pF (pico-farad) caps to compliment the 1uF (micro-farad), equivalvent to 1,000,000pF Obbligatos. The rule of thumb is that a bypass should be 1% or less of the cap it is bypassing, so this little guy is 0.22%. I'm currently using a very special custom 10-3 right angle power cord with this kit (my own recipe). Take a look at the details here. UPDATE (5/30/2011): A pair of Hammond 155J chokes were added to the power supply in place of the two 1K resistors. On paper, they are 1026 ohms +/- 15%. In practice, they measured about 900 ohms each, which should be close enough for this purpose. 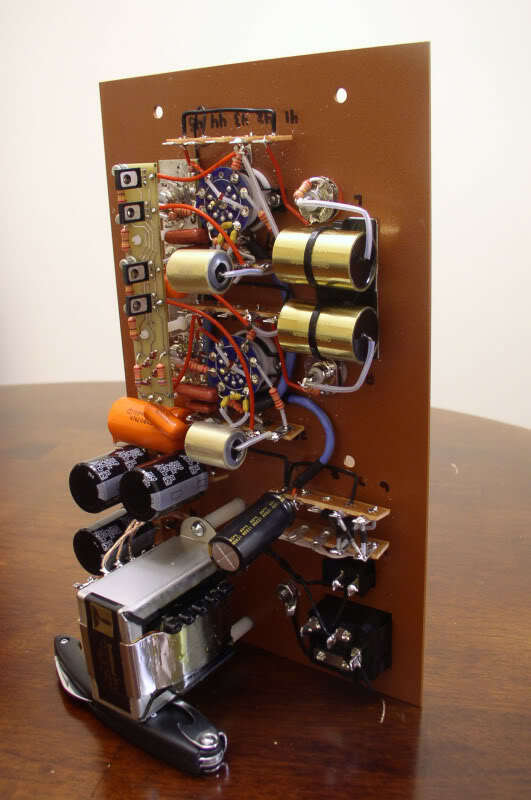 Chokes allows better filtering in the power supply (less hum in the output of the amp and less voltage drop) which should translate to better sound. There's a nice quick lesson on the purpose of chokes here. Since the stock Bottlehead design lifts the transformer with a pair of standoffs for noise reduction, I decided to use a pair of standoffs for the chokes to physically move them away from the tubes. As typical with Bottlehead kits, once you start dropping in some fancy parts, the real estate tends to go pretty quickly. The most accommodating place to mount them in my case was right next to the C4S constant current upgrade board. The upgrade required about a half hour of time to mount the chokes and solder them in place, along with about $30 plus shipping for the chokes themselves. I also opted to add a little bit of Dynamat Xtreme to the tops of the chokes and the main transformer to help dampen a little bit of vibration. I'm listening away to the new Radiohead The King of Limbs vinyl as I write this, the sound is warm and smooth, just as a record should sound.